When I find a "new" plant, I like to test it out in my own garden to see how it performs under real-life conditions. Some plants that will be fine in a nursery, growing in perfect conditions, may not be so successful when they have to fend for themselves in a garden, especially if the gardener is not completely diligent. In the past couple of years I've been experimenting with the dwarf shasta daisies. These are leucanthemum hybrids, and there are a few different ones around. I have found all of them to be just as free-flowering, tough and easy to grow as their tall parents. Shasta daisies are clump-forming perennials, not shrubs like most other daisies. They have single white flowers with bright yellow centres. The leaves are a lovely bright green and have serrated edges. 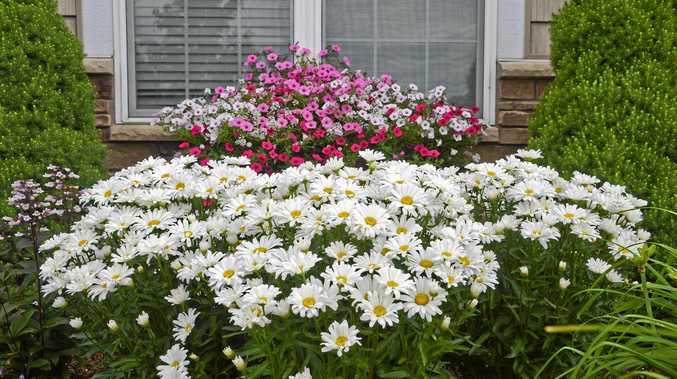 The original shasta daisies will grow up to 1m tall, and make a great background plant in a flower bed. These new hybrid forms are much shorter, so they don't need staking, and can be used as a groundcover or in a pot. They flower profusely from late winter into spring and summer. They have a dense, spreading habit, which is brilliant for suppressing weed growth. They are resistant to heat and humidity, making them ideal for our climate. Little Angel grows about 15cm tall, with flower spikes about 20cm tall. Daisy May is a bit taller, with flowers about 40cm tall held about foliage that is about 25cm high. Both have a spread of about 30cm. Shasta daisies grow best in a full sun to partly shaded position in free-draining soil that has been enriched with organic matter. Care is pretty simple. Water when dry, but don't over-water. Remove spent blooms to keep the flowers coming, or pick them and enjoy them in a vase inside. Remove all the old-looking growth at the end of the flowering season, cutting the flowering stems right back to the ground but leaving the nice fresh leaves.